In situ chemical oxidation (ISCO) involves the injection or direct mixing of reactive chemical oxidants into groundwater and soil for the primary purpose of rapid and complete contaminant destruction. 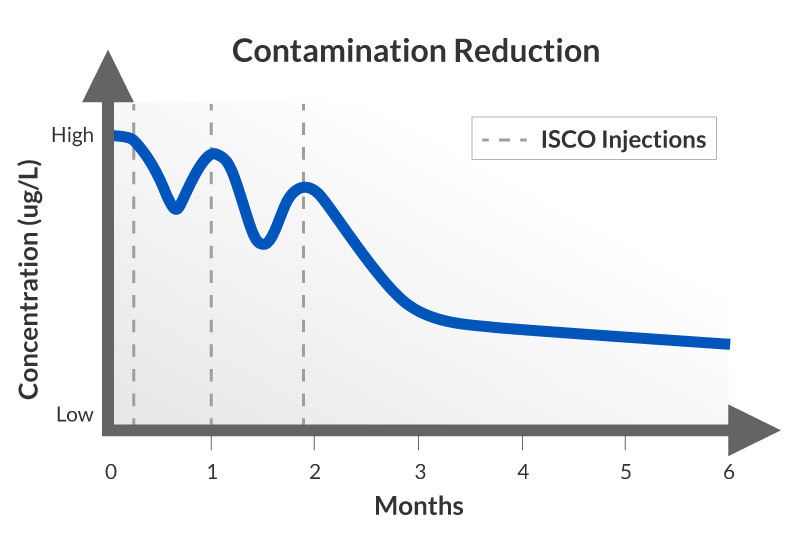 ISCO is a versatile treatment technology that is most often deployed in source zones characterized by moderate to high contaminant concentrations in groundwater, significant sorbed contamination, and the potential presence of residual, separate-phase contamination (LNAPL or DNAPL droplets or ribbons). Successful treatment of source zones requires a detailed understanding of the nature and distribution of contaminant mass as well as an aggressive application approach that will maximize oxidant-contaminant contact and deliver a sufficient amount of oxidant to treat the dissolved, sorbed, and separate-phase contaminants. REGENESIS offers two safe and effective oxidation technologies for soil and groundwater treatment – PersulfOx® and RegenOx®. Both of our ISCO technologies employ unique and powerful catalysts to maximize treatment longevity, ensure efficient oxidation, and promote safe chemical use in the field. REGENESIS welcomes the opportunity to provide you and your team with the tools you need to successfully plan and execute your next ISCO project. Is ISCO the right solution for your contamination concern? Find out here. 9 Reasons to Consider In Situ Chemical Oxidation to Treat Your Site. Download eBook. Have a look at our track record with ISCO with these Case Studies. What is In Situ Chemical Oxidation? In situ chemical oxidation (ISCO) involves the direct mixing of reactive chemical oxidants into the groundwater and soil in order to quickly eliminate contaminants within the subsurface. ISCO is a versatile treatment technology that is often deployed in source zones characterized by moderate to high contaminant concentrations in groundwater, significant sorbed contamination, and the potential presence of residual, separate-phase contamination (LNAPL or DNAPL droplets or ribbons). Is In Situ Chemical Oxidation right for my project? In Situ Chemical Oxidation is right for your project if the source zones have moderate to high contaminant concentrations in groundwater, significant sorbed contamination, and the potential presence of residual, separate-phase contamination (LNAPL or DNAPL droplets or ribbons). Additionally, ISCO requires that you have a detailed understanding of the nature and distribution of contaminant mass as well as an aggressive application approach that will maximize oxidant-contaminant contact and deliver a sufficient amount of oxidant to treat the contaminants. Is In Situ Chemical Oxidation safe? During In Situ Chemical Oxidation, the chemical reaction varies according to the oxidant amendment used, the contaminant, and the subsurface geochemistry. Many chemical oxidants have been brought in from other industry sectors and can be hazardous. Certain technologies, such as RegenOx, have been developed specifically for sensitive environmental use in aquifer restoration. RegenOx is a power, yet safe amendment, that leaves no deleterious residues behind and remain a resilient treatment with additional bioremediation techniques.